8 Who Should Buy Email Marketing Success? 9 Not A Newcomer To Email Marketing? Earlier this week I was very pleased to be invited to write a review of Email Marketing Success, a new course by James McAllister. Regular readers will remember I interviewed James earlier in the year. He may be best known to bloggers for his blog JamesMcAllisterOnline.com – but there’s a lot more to him than that! Before I tell you my thoughts, and describe the contents of the course, I’ll let James set the scene for his new course “Email Marketing Success”. Click the image below to watch the video. 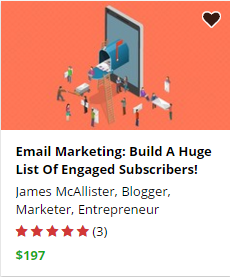 It’s less than 2 minutes long and describes briefly how James will teach you to build a huge list of engaged subscribers when you TAKE THE COURSE. By the way, James has given an introductory 51% discount on his course for my readers. I’m not sure how long this will last so, don’t wait to TAKE THE COURSE! The course is in 5 main sections (plus a 6th which gives you discounts to James’ other courses), so I plan to list the contents and give my review of Email Marketing Success section by section. Most of the training consists of short videos, but sometimes there’s downloadable information – which I like, because you can make your own notes as you work through them. Another thing I like is that the videos are in bite-sized chunks so, assisted by the index that scrolls in the right hand side-bar, you can easily return to a point that was of interest. I hate long videos where, if you want to review one particular section of a course, you have to dip in and out of a long video to try and find where the point was made. At the end of each section there’s a quiz to help you assimilate what you learned, and you can see how you’re performing compared to others in the class. 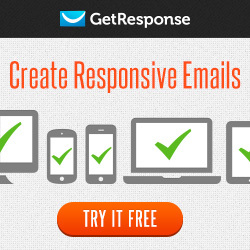 Do You Need A Website To Utilize Email Marketing? Email Marketing Is Going Nowhere! James sets the scene right away by debunking the myth that email marketing is dead, having been replaced by social media. I’ve written extensively about that subject myself, so nothing to argue about from my point of view. But if anyone still thinks they should be using social media marketing instead of email marketing, I’m sure James will change your mind. Trying to run a business without an email list when I started my first website, several years ago, was my biggest mistake. It probably set me back many years, so it’s a topic I’m really passionate about. As well as putting us right on email marketing, James also debunks a blogging myth in this section. What Email Marketing Service Is Best For You? Problem Solving vs. Hobby Niches – These Are Handled Drastically Differently! High Competition Vs. Low Competition Markets – Which Is Better? Again we are in agreement. Many newcomers to online business, finally persuaded of the need to build an email list, will try to cut corners by choosing a free service. James explains why this is a false economy. Although this is something I have also written about previously, James came up with some extra reasons I hadn’t thought of. The course includes a fair and detailed comparison of Aweber vs GetResponse. 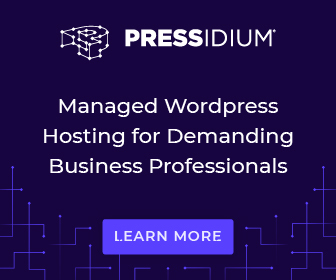 I recently switched to GetResponse and have been using it for a few months now, but I still learned some new tricks from Email Marketing Success. The videos teaching you about the tricky area of niche selection are excellent. This is probably the area where most aspiring email marketers fail before they even get started. There are four videos that go in depth to help you choose a niche, including the different ways to market to different niche types (as opposed to topics). By this I mean hobby vs problem solving and low vs high competition. There are many extremely valuable tips here. Bloggers: How To Automatically Share New Posts With Your RSS Feed! Segmenting Your List – Set This Up In Advance! Even if you have chosen a different email marketing from James, this is a valuable section because you will find these facilities in good auto-responders – once you know to look for them. Although I know about these tricks NOW, I didn’t when I first started with email marketing, and I really wish I had implemented them from the start of my email marketing career. PLR – When And How Should You Actually Use It? Where Should You Place Your Opt-in Forms? Should You Use Pop-Ups? This Ends The Debate! 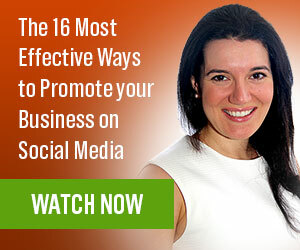 Social Proof Can Increase Conversions! 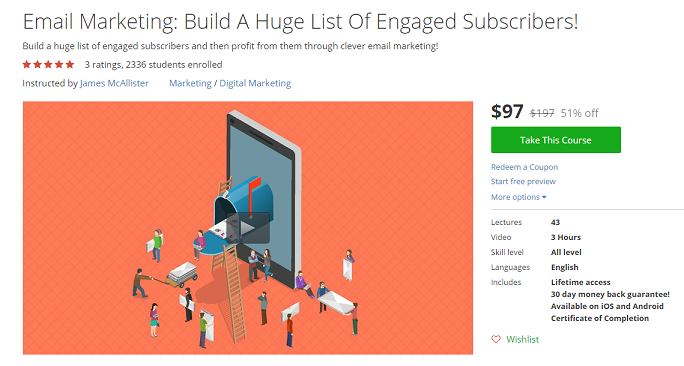 It’s all well and good to talk about email marketing, but without the parallel topic of list-building it’s all of academic interest – so no surprise that this is the longest section of the course. Pop-ups…. hmmm, well he’s almost got me persuaded. NOTHING wrong with them if you implement opt-in pop-up boxes the way James suggests, but most people don’t, and I hate them with a passion. So if you’re not following James’s teaching, your readers are probably – like me – automatically closing your pop-ups as soon as they appear. Learn from James what to do instead. I had to smile about “Don’t worry about unsubscribes” – I remember being mortified by my first unsubscribe – I devoted a whole blog post to agonizing what I had done wrong LOL. Happily my commenting friends soon set me right. So, yes, be prepared, it will happen. You will learn in this video how it can actually be a good thing. Overall there are some great suggestions in this section, some of which I will be implementing myself. Do pay particular attention to James’s advice on testing. What Should Be In Your Autoresponder? Disclaimers – Stay Out Of Legal Trouble! Finally we come to most people’s reason for building a list – to make a profit! There are many tips here – especially in the crucial area of how to get your emails (a) into a subscriber’s in-box and (b) actually opened. 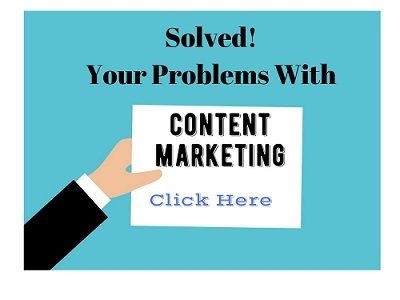 The latter is probably the most difficult part of email marketing, so I for one value all the improvements I can make, and James includes some very “easy to implement” quick fixes, as well as more in-depth tactics. He even introduces you to a way to make money from the freebie-seekers on your list! One area of “Email Marketing Success” that I want to revisit is selling high ticket items, because it’s an area I’m particularly interested in. Think that people won’t buy something when they’re broke? How many people do you know who have cars when they’re having trouble paying their rent bills? That’s NOT to imply that James encourages people to make purchases they can’t afford – he certainly doesn’t. But there are times when buying a higher quality (more expensive) product will give a more valuable solution than repeated purchases of $9.99 courses that are discarded and forgotten. For new-comers to the industry, it’s important to know how to stay legal, so pay heed to the important reminders on how to keep out of trouble. I have very few criticisms / disagreements with James’s course, and they are really minor. In the list-building section you will start to consider paid methods of getting traffic and that can become risky. James certainly warns that there are risks, but I feel he should have explained in more depth the risks of certain list-building approaches. Anyway, James is open to feedback and keen to keep the course content fresh so I’ll give him my feedback, and perhaps he’ll expand upon the points I make. Let me say right away that NOTHING James suggests is at all black-hat or unethical, quite the opposite. However a couple of the list-building tactics he discussed were ones I tried when I was a real beginner, far more innocent than I am now – and I had problems! Perhaps I’m just being over-cautious because of my experiences as a complete beginner to list-builder. Despite being on a coaching course, NOT with anyone I mention on my current blog – it was years ago…. I lost money on some badly targeted Pay-Per-Click campaigns. When I persuaded the “coach” to run his own campaign for me, HE lost even more money for me. An offline business I know was doing really well finding customers by PPC, then competitors started clicking her ads and she ended up with her earnings just covering the PPC bill. I managed to pick CPA offers that left a nasty taste in the mouth of subscribers and myself. (A weight-loss “free” trial that took my credit card for P&P, then turned itself into a repeat subscription that proved extremely difficult to cancel. 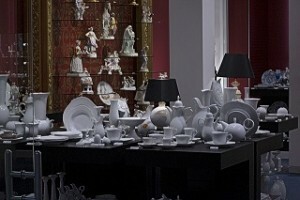 In fact I had to completely stop the credit card.) Yeah – should have read the T&Cs properly – all 8 pages of them! I will emphasize that these were down to my inexperience of the online world, and other people’s dishonesty, but as this course is targeted at beginners I hope James will give more warnings of some of the things that can go wrong. Having made every mistake in the online book, I don’t want any-one else to make them. I blundered into Internet Marketing like a “bull in a china shop”. If you carefully follow James’s advice on testing, you won’t make my mistakes. Another slight disagreement we have is about what to put on an opt-in form. I’ve tried both approaches that he discusses and have come to an opposite conclusion. I still have examples of both around my site – so you’ll need to study the course and make up your own mind before deciding which you prefer. Although James and I have one or two differences of opinion, James’s list is bigger than mine, so…. form your own conclusions. Most of the points James makes I agree with 100%, and I’ll be making changes to how I run my sites as a result of studying his course. Who Should Buy Email Marketing Success? If you are new to email marketing and / or just starting an online business this course is probably the most valuable investment you can make in your future. On the right you can read the review of Email Marketing Success that I left on Udemy, along with another view by Nate Jones. Sorry I appear as a mystery person – I did try to put my image onto my profile, but for some reason it didn’t “take” – sigh…. computers! Not A Newcomer To Email Marketing? Perhaps you’re NOT new to email marketing and online business and you already have a list and know the basics. You may be wondering whether you will learn anything new? To be honest, I’d be surprised if you didn’t pick up several new tips. I’ve been doing email marketing for a few years now but I still found plenty of “meat” within Email Marketing Success, by James McAllister. However James, on his detailed course description, discloses up-front that the course is for “beginner to intermediate” rather than advanced marketers. Only you can finally decide – but to help you make up your mind, look at the size of your own list, and the value of sales you’re making each month from that list. Is there room for improvement? Let’s face it, implementing ONE profit-building lesson could be enough to cover the cost of the course many times over. I hope you found my review helpful. Click here to learn more about “Email Marketing Success”. Wow, thank you so much for this incredible review. I love the way you laid it out and I’m so glad to hear that even as an experienced email marketer, you still found a lot of value in it. I have taken note of your suggestions and will begin making new lectures to accomodate your feedback as soon as possible. If anybody has any questions regarding the course, me, email marketing, or anything else for that matter – ask away. I will be monitoring the comments and will try to get back to you as soon as possible. Glad you felt I did the course justice – I really did learn from it. Thanks also, for taking on board some of my thoughts. Sometimes, even when you been doing something a long time, it’s good to go back to basics – because there’s almost always something you can learn from and do better. The Udemy platform makes it very easy to get back to previous courses, without having to scramble about on my cluttered hard drive. I know where to find it again – and it’s easy to pinpoint the exact video I want to review. I’ve already implemented some of your tips, and notes in the diary to do more. Excellent review of McAllister’s email marketing success course. From my experiences with him, he’s a good guy and he really tries to deliver more than he promises. I’ve worked with James for quite some time now, and he’s really helpful and always goes the extra mile for his clients. Starting to “wind down” now – Russ has arrived and the girls will be here when nursery finishes, then the pace will really hot up! What a great review you’ve got here. It’s thorough, objective – and candid too! Knowing James I would always be confident that anything he produces is top notch, but it’s good to see validation from someone like yourself. Glad you like the review. Yes, James is doing really well. He’s certainly one to watch. Even though I have been list-building for quite some time now I still picked up new tips. I think when you first start learning about something your head gets kind of full, but then when you come back to the subject later, you’ve assimilated what you learned before and there’s room to learn even more – which is why the Udemy format is great for keeping your courses in one place. I really like your style of writing. It is so easy to read and understand. You have given a really excellent review. What a fabulous collection of ideas and tips. Your post has made me completely rethink my welcome email messages. Like some of your other commentators I have been using the “simply hit the reply tab and ask my anything” type strategy – the main reasons for this was to show I really wanted to help in any way I could plus the very action of replying would definitely help my ability to inbox with them in the future. The concept of disclosing issues like the “free gift bribe” in the welcome email is something I have never considered. I like the ethics of this and will definitely be adopting this practice. His books are amazing and courses superb. When it comes to email marketing, James knows how it all works. He is a pro! So if anyone needs help, James is the go to guy. James is a great guy and a hard worker. He has been extremely helpful to me “in the background” too, so it’s not just all talk. 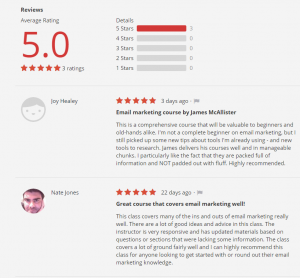 What a fabulous review of James’s email marketing course. I don’t know him, but will certainly remember his name in the future, and I’m sure I’ll start to see him around, as usually happens when you become aware of something in life! That was a superb product breakdown, and it clearly covers all one needs to know, for what is a challenging part of marketing online. Email marketing appears to be re-immerging now as a real brand builder for genuine and individual marketers with their own message to share. There did seem to be a time when the future of email marketing seemed a bit iffy, but I agree, it’s back in the ascendancy now. I have recently introduced James to PAC, so you’ll probably bump into him there. Wow! You are an amazing writer – and your review of James McAllister’s course is so comprehensive, it draws us to give it a second glance and a second thought! May come back for that “second glance”, hahaha! Thanks for your kind words – James’ course was easy to review, because there’s so much good to say about it. There are two ways to do an email marketing campaign. Below are the email marketing companies who provides minimum 1000 to 2000 emails/ month for free. Thanks for your suggestions, but the course explains why we don’t think that free services are the best option. you really did a beautiful job with this review. everybody who wants to do email marketing. like Donna said the go to guy. It’s always a pleasure to review products from GOOD product creators, such as James. I’ve had a lot of dealings with him over the last year and a bit and he’s wise beyond his years – yet still a really nice chap. Even though I’ve been doing email marketing for quite some time now, I still learned new tips from this course. I’m afraid I never tried MailChimp – for the reasons given in the post. I have no reason to doubt that it’s a great mailer, but my recommendataion – especially for a larger enterprise – would be Aweber or GetResponse. I have heard good reports of Infusionsoft too, but again, being a small company, it wasn’t a product within my price range.